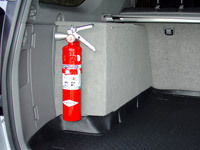 I carry a 2.5 pound Halotron-1 Fire Extinguisher for fire safety. This was purchased from Fire End Corporation. I chose the Chief Croker Halotron I stored pressure fire extinguisher model # A385TS with vehicle mounting bracket. 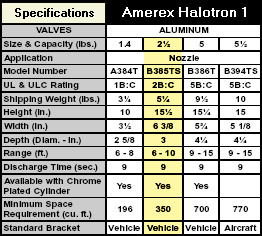 It is made by Amerex. Rugged and dependable drawn steel cylinders. EPA approved "Clean Agent" for Class A, B and C hazards. Low ODP (Ozone Depletion Potential). User friendly, Maximum visibility during discharge. HALOTRON I is a “Clean Agent” HydroChloroFluoroCarbon (HCFC) discharged as a rapidly evaporating liquid which leaves no residue. It effectively extinguishes Class A and B fires by cooling and smothering and it will not conduct electricity back to the operator. Halotron is pressurized with Argon gas and is an EPA and FAA approved agent suitable for use on Class A, B and C fires. It has a low GWP (Global Warming Potential) of 0.04 - 0.24, low ODP (Ozone Depletion Potential) of 0.014 (twelve times lower than the EPA maximum allowable ODP of 0.20) and a low Atmospheric Lifetime (3½ to 11 years). Halotron is intended for use in areas formerly protected by Halon 1211 hand portable extinguishers such as computer rooms, telecommunications facilities, clean rooms, data storage areas, offices (for protection of sensitive electronic equipment), boats and vehicles. 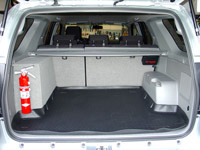 The extinguisher comes with a sturdy all steel vehicle mounting bracket which I mounted to a cargo organizer box I built myself. One of the primary reasons for building the box was to securely mount this extinguisher. My original thought was to mount the bracket to the driver side jack storage compartment door. I decided against that as I was somewhat worried that even in a minor accident the weight of the extinguisher may rip the plastic door off and send it flying about the cabin if mounted there.